The top two teams in the world played two incredible series. Here are the best plays. Last week, we were treated to some of the best League of Legends action we’ve seen this year as South Korea’s SK Telecom T1 faced off against KT Rolster. Color commentator Chris “PapaSmithy” Smith called the first series “the best best-of-three” he’s ever seen. Unfortunately for many North American (and European) fans, the two LCK series were played in the early hours of the morning. So we put together a list of the top 10 moments from each game. These two are clearly the best teams in the world, and together, they put together some insane highlights. Enjoy! SKT had just taken an infernal drake, but that put them in an awkward position as KT ran it down mid. Looking for a pick, KT support Cho “Mata” Se-hyeong went all-in on SKT ADC Bae “Bang” Jun-sik. Bang managed to survive on the slippery Ezreal, but more impressively was Mata’s ability to thrown down the box and get out. He even sidestepped the Graves ult, which is extremely hard to do. The chaos that he caused bought KT enough time to bring in the Equalizer which gave KT another turret. 2) Faker: What is that damage? What do you do when you eat an exhaust in the face? If you’re SKT’s Lee “Faker” Sang-heok, you keep walking into the enemy base. Fighting through the exhaust, he did over 600 damage to KT mid laner Heo “PawN” Won-seok. That set up PawN perfectly to get blasted back to the fountain by Yoon “Peanut” Wang-ho’s Graves ultimate. Then, with exhaust gone, Faker turned his attention to KT’s ADC, doing over 900 damage with a single spell. Even Faker isn’t invincible though, and PawN has served as his foil in the past. In this play, he makes it out of the one vs. one, only to get stunned by an Ashe arrow from KT ADC Kim “Deft” Hyuk-kyu. Right when Deft hit “R” to release the arrow, Song “Smeb” Kyung-ho began to channel is teleport. Faker and Peanut were caught between the Rumble equalizer and the rest of KT and both went down in the fray. With Bang dead, Baron buff on KT, and a 10-kill deficit, the game was completely in KT’s hands. All they had to do was get back to their fountain and start sieging. But Faker had other ideas. When KT turned on to Heo “Huni“ Seung-hoon, he flashed over the wall and–with an assist from a Nami ult–threw down his Shockwave on four KT members. In a blink of an eye, all four were eviscerated, leaving only one to tell the tale of Faker’s Orianna. The deciding game in the first series was a tense, back-and-forth affair. But after nearly an hour of battling on the rift, KT looked to have the upper hand. They had more inhibitors down, more map control, and more avenues into the enemy base. All game, the two forces that had held back the KT wave were Faker (playing Zed) and Huni (on Rumble). Huni was magnificent, laying down perfect ults and flashing in for kills. When SKT was at its most desperate, Huni and Faker shined. It looked like KT had won the fight and forced Huni into his Zhonya’s stasis. But SKT support Lee “Wolf” Jae-wan made a clutch save by flash-devouring the Rumble, allowing Huni to live long enough to cast the Equalizer. Huni paid for it with his life, but he gave time for Faker to clean up the rest of KT and win the game. KT thought they finally had a good fight as Smeb used Twisted Advance on Huni. It must to be terrifying, even for a gnarly pirate like Gangplank, to see a massive tree lock on to you. But Huni, popping oranges left and right, somehow lived to tell the tale, while the rest of SKT dominated KT in the teamfight. Pirate: 1, Tree: 0. 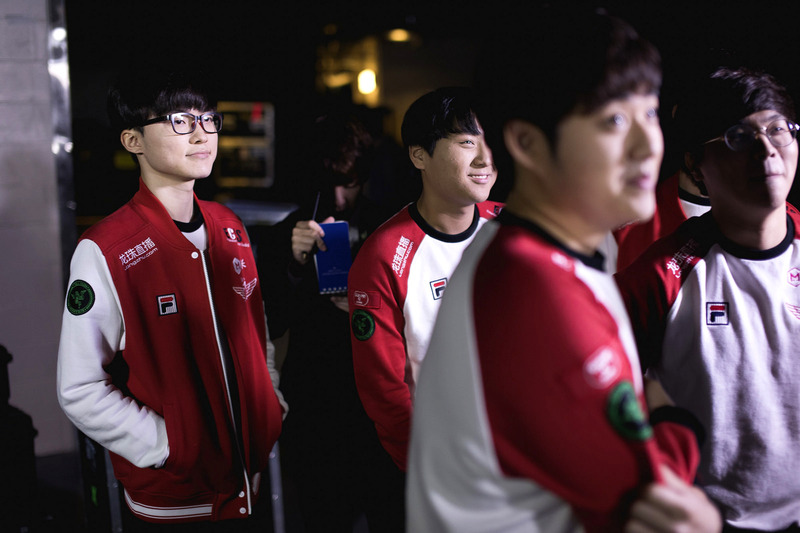 Behind Huni’s fed Gangplank, SKT was in total control of game one. That made this play plain unfair. Faker sent the Orianna ball over the wall to lock down PawN and Mata, with PawN dying almost immediately. Mata had just about escaped when Bang fired off a bouncing grenade. The grenade bounced off of Score’s head, hung for what seemed like an eternity, and then crashed down on Mata. A six thousand gold lead and good grenade RNG? That’s cruel. Peanut thought he had a sneaky flank prepared. Playing Rengar, he activated his invisibility and snaked around the backside of KT, looking to assassinate someone. But Peanut’s former teammate, Smeb, saw the play before it started. Before Peanut even started his leap, Smeb began his hookshot, locking down the big cat in mid-pounce. Who knew that, in addition to being a leg-bladed killer, Camille also had psychic powers? Or is it Smeb that doubles as a fortune teller? The two flagship teams reached another deciding game three in the second series. Just like the first match, the game was tense and even, with KT grabbing three straight mountain drakes to more than make up an SKT gold lead. The game was also notable for SKT subbing in Kang “Blank” Sun-gu (which they did in the third game of the previous series as well) and Kim “Profit” Jun-hyung. Both had big contributions, perhaps none greater than on a contested Baron call. Profit was assigned to keep KT jungler Go “Score” Dong-bin away from the pit. Good vision on the backside of the pit allowed Profit to chunk Score down considerably. Deciding that killing Score was the best form of distraction, Profit flashed over the wall and burned Score to the ground, allowing Blank to secure a clean Baron for SKT. Even with the Baron buff, SKT found it difficult to get through the KT defense, featuring loads of waveclear from Ziggs and Jayce. They also found it tough to force a fight, with no real frontline or hard initiation. In a move that we would NOT advise for solo queue, Bang took it upon himself to start fights–and end them. Again and again, he Arcane Shifted into the enemy team, popped off his spells, and somehow lived. In this clip, he fought Smeb’s Talon one-on-one, trusting that his mechanics (and a timely Lulu ult) would save him. Even when the Jayce jumped onto him, Bang emerged victorious, taking down KT nexus. Damn, that Ezreal is clean. Bang is frequently mentioned as one of the top ADCs in the world. Maybe it’s time to drop “one of” from that sentence. Congrats, Bang! As these highlights attest, the series between these two was League at its finest. We’re hoping they make it to the playoffs where they can duke it out in a best-of-five.